Recalled Midwest-CBK Midwest Gift brand Baby Rattle Socks - Perfect Pair. The 100 percent cotton socks have an animal or character sewn onto the toe of the socks. A brand of baby rattle socks is being recalled because small ornaments can detach and become a choking hazard. The recall involves 22,600 pairs of "Midwest Gift brand Baby Rattle Socks - Perfect Pair," according to the Consumer Product Safety Commission. 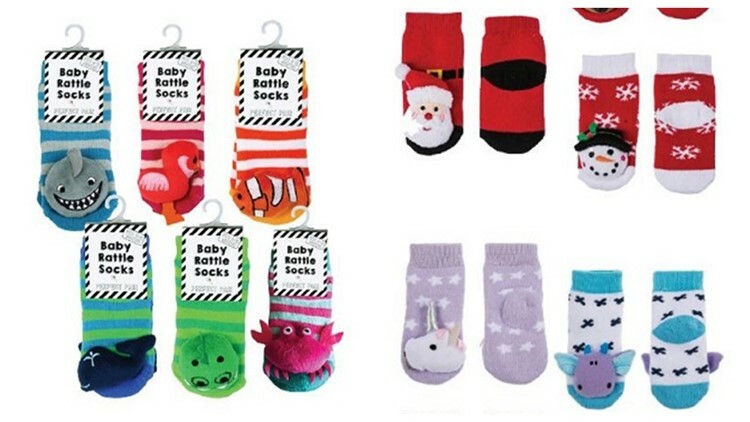 The 100 percent cotton socks have an animal or character sewn onto the toe of the socks, including a snowman, reindeer, whale, flamingo, tiger, or shark. They were sold in children's sizes of zero to 12 months. The socks were sold nationwide in boutique gift stores from October 2017 to December 2018 for about $10. Consumers are advised to immediately take the socks away from children and contact manufacturer Midwest-CBK for a full refund. The company can be reached at 800-394-4225 from 9 a.m. to 5 p.m. EDT Monday through Friday, or email productrecovery@mwcbk.com.